October 13, 1910 –The Chicago Sanitary District authorizes the first step in the construction of the Calumet-Sag drainage canal. The plan will see the flow of the Calumet River reversed with “the whole of the city’s sewage [emptying] into the great drainage canal.” [Chicago Daily Tribune, October 14, 1920] The decision to proceed on the project is made at a meeting of the trustees of the Sanitary District after they are assured that enough right-of-way for the canal has been purchased to proceed. The canal will be 22 miles with a width of 65 feet and a depth of 18 feet. When the project is completed “the southern drainage canal will stretch from the mouth of the Calumet river, which emptied into Lake Michigan, near Eighty-ninth street, to its juncture with the big drainage canal between Spring Forest and Lemont.” Nearly 700,000 people will see the quality of life improve as Lake Michigan will be purified, after the reversal of the river, and Hyde Park and the entire south side of the city all the way to South Chicago will be drained. Estimates for the cost of the project exceed $5,700,000 with much of the cost offset by the leasing of dock sites along the new channel. The decision on this date ends an eight-year struggle between the Sanitary District and the federal government over the amount of water that the canal can draw from the lake. In 1907 the Sanitary District actually began work on the canal which was halted when the United States applied for an injunction restraining the district from taking water from the lake. The canal will draw 2,000 cubic feet of Lake Michigan water every second, about half of what was originally proposed. 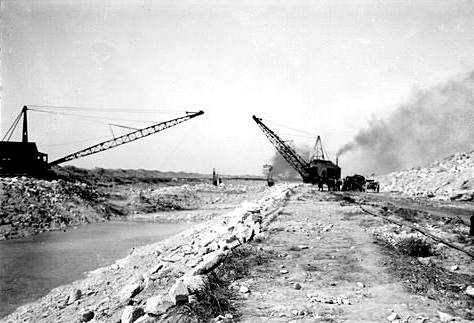 The above photo shows the work on the project in 1911, probably at a point near Blue Island. 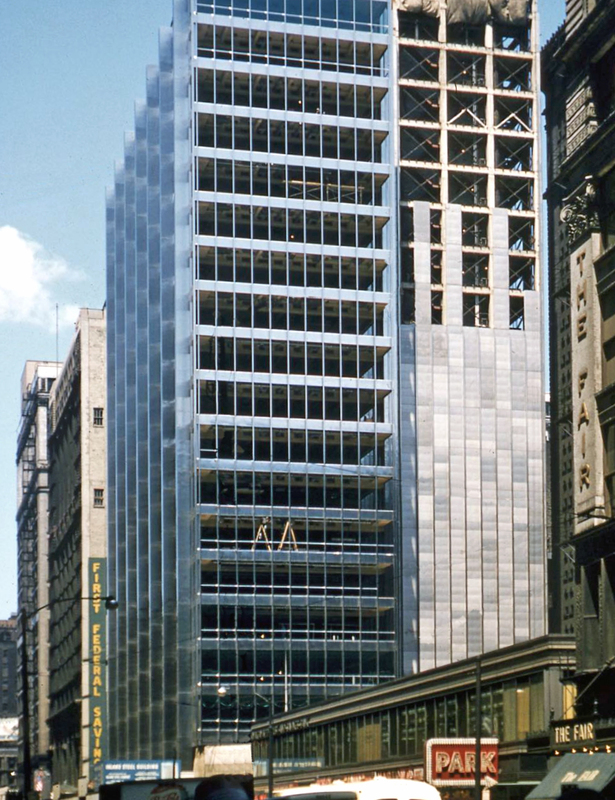 October 13, 1954 – The Chicago Board of Education approves a lease with the Inland Steel Company for the northeast corner of Dearborn and Monroe Streets, a site on which the company plans to build a six million-dollar headquarters. It is anticipated that the lease will bring $84,000 to the school system for at least 20 years. The site is presently occupied by the seven-story Crilly building, which is owned and managed by the school board. Inland Steel proposes a building of 17 stories with 75 percent of the space in the tower available for rent. The steel company’s plans are to leave its offices on two floors of the First National Bank building at 38 South Dearborn Street and use approximately one-third of the space in the new tower. 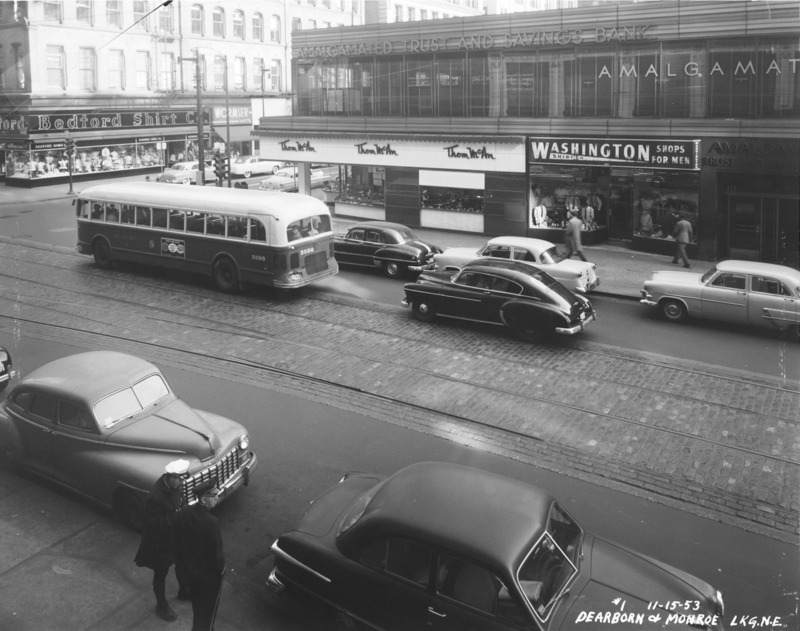 The Crilly Building is shown (with the Bedford Shirt Company store) in the black and white photo. Inland Steel is also shown under construction in 1958 in the photo below it. October 13, 1952 – Funeral services for architect Robert Seely De Golyer are held in the First Methodist Church in Evanston. De Golyer attended public school in Evanston and went on to earn degrees from Yale University and the Massachusetts Institute of Technology. De Golyer is largely forgotten these days, but a ride down Lake Shore Drive from the north to the south side will take you past nearly a dozen great residential buildings that he designed. Perhaps most notable are his Barry Apartments at Barry Avenue and Sheridan Road, the Ambassador East Hotel on North State Parkway, and the Powhatan on Chicago Beach Drive. During the Depression when construction came to a virtual halt in the country, the federal Public Works Administration chose the De Golyer to head a group of 15 architects as they designed the Julia C. Lathrop Homes at Diversey Parkway and the Chicago River, a huge complex where ground was broken on October 11, 2017 for revitalization. De Golyer also was a principal architect in the planning of the Pentagon. 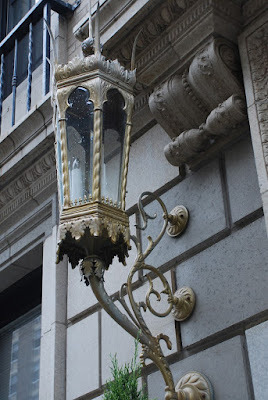 The photo above shows the meticulous design of De Golyer, this detail at the entrance of 3100 Sheridan Road, The Barry.